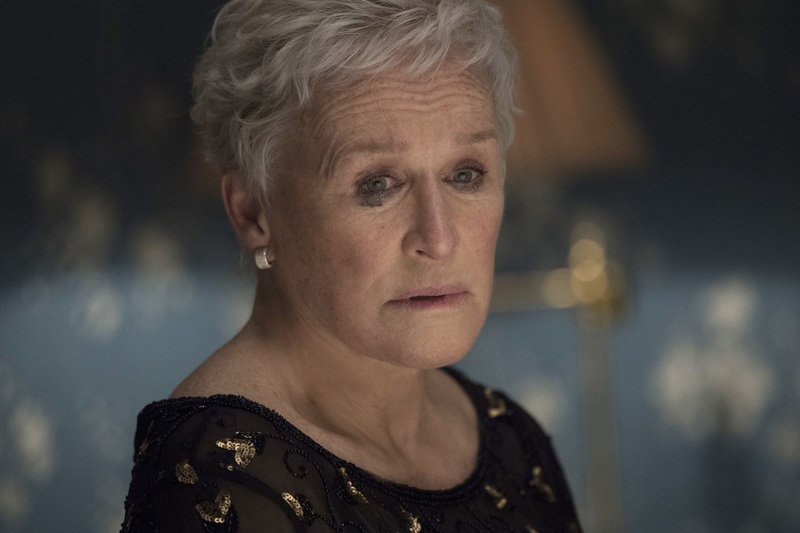 Interview: Glenn Close On 'The Wife,' Close-Up Shots And The Golden Globe Speech Her latest movie role earned her a nomination for the best actress Oscar. Ahead of the ceremony, she talks about facing the camera, her viral Golden Globes speech and her love of theater. Glenn Close plays Joan, the titular wife in The Wife. The role has earned her an Academy Award nomination for best actress. The movie The Wife opens with a phone call. For decades, she's been doing more than proofreading her husband's books: She's been writing them herself. And that lifelong buried secret is conveyed in a stark close-up shot. "Film is the only art form that has the close-up," Close said during a recent public interview held at KCRW in Santa Monica, Calif. "And the close-up, when you think about it, is the human face showing emotion. And I've learned over the years that the close-up, well done, is what keeps the audience emotionally involved." It's a lesson that Close first learned in the early 1980s, while working on The Big Chill. "It was just my second film, and it was in the scene where I am talking to JoBeth Williams' character about the affair that I had had with the man who had just committed suicide," she says. "And I realized during that scene that what was not being said was powerful — and that film is so intimate in moments like that, that you can trust them." 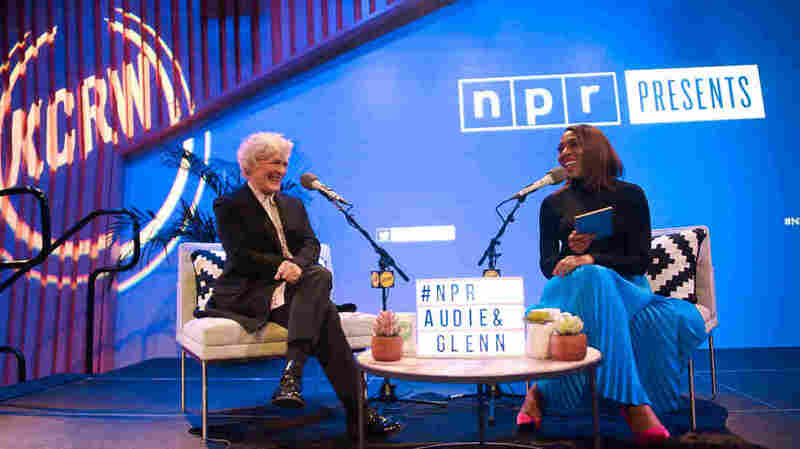 Audie Cornish and Glenn Close spoke at the Annenberg Performance Studio at KCRW in Santa Monica, Calif.
Close has already won a handful of awards for her performance in The Wife, including a Golden Globe. She's the front-runner for the Oscar for best actress. It's her seventh nomination for an Academy Award. The new film has gotten a lot of attention because of its star's performance, but also because of its subject matter. The story of a woman whose contributions are overshadowed by a powerful man has resonated with audiences in this moment. In fact, screenwriter Jane Anderson — who adapted a 2003 novel by Meg Wolitzer — said it took 14 years to get The Wife made, in part because no male American star would accept second billing to a woman. In this film, the British actor Jonathan Pryce plays "the husband." "Think about it — actors, star actors have big egos — that nobody wanted to be in a film called The Wife," Close says. "But Jonathan Pryce, he allowed that. He said, 'Too bad it's not called The Husband.' I mean, you know --but that's the thankless part of the film. Here I am with all this acclaim, and he has not gotten anything out of it. And that's why I love Jonathan Pryce for what he did. And he's my date [to the Oscars]." I'm thinking of my mom who really sublimated herself to my father her whole life. And in her 80s, she said to me, "I feel I haven't accomplished anything." And it was so not right. And I feel what I've learned through this whole experience is that — you know, women, we're nurturers, that's what's expected of us, we have our children, we have our husbands if we're lucky enough, and our partners, whoever. But we have to find personal fulfillment. We have to ... follow our dreams. We have to say: I can do that, and I should be allowed to do that. [My mom] and my dad got married when they were 18. And basically from that moment on, she was the major child-rearer. And I think my dad, he had his own story. He was sent off to school — his father was the director of the American hospital in Paris. They lived there, but they were sent — he and his twin brother were sent across the [English] Channel to an English boarding school when they were 7 years old. And for my father and for his sensitivity, it was the wrong thing for him. I think for him, it was abandonment. And that's why in the movie, it was one of the hardest scenes for me to film. I've told my husband I'm going to leave him, he has a heart attack, and he says, "Do you love me?" And I stopped the shooting. I said, "Does he have to ask me that? That's so unfair!" But when I think about it, I think he's never thought of himself as worthy of love. Probably the stage. That's because, I mean, to me that's like the essence of the craft, and if you can't hold an audience from the stage, you've lost something in your craft. I just finished — I did 14 weeks at the Public Theater in New York, played Joan of Arc's mother. And that — oh my God. Every night, having to bathe my daughter to be taken off to the stake — it was exhausting, but thrilling. Because it was an intimate theater, the audience was this close, and you can't fool anybody, you know? You gotta come up with the goods eight times a week. And you know, you get back there, and I thought: Well, I still got it; I still can do it. Gotta check up every now and then. Bilal Qureshi, Joanna Pawlowska and Connor Donevan produced this interview for broadcast. Patrick Jarenwattananon adapted it for the Web.